I took this photo as a partner to the autumn version " http://365project.org/judithg/365/2011-11-02" They are a good value tree - always so pretty! That sun on the blossom lights the whole photo up Judith !! Love the way to that those punt cushions glow blue giving more interest on the water !! All looks very serene & if I was not living in England I would want to come pronto !! I have been telling Jack this afternoon about the young man from Dublin on BGT last night. He wrote his own songs, sang & played the guitar beautifully but all I got was ' but I can't sing Granny '' He should learn because all the rest he can do & earn lots of money !! @happypat Oh he was great wasn't he?!!! I bet Jack could learn - he's obviously got a musical ear! Thanks for the fav! What a wonderful picture to accompany the autumn one, amazing how light and season can change the image completely - that sounds obvious but you know what I mean. Does make an excellent companion shot to the autumn one. Love the blossom - so pretty. Really lovely... such a picturesque scene! Beautiful! Those glowing cushions really add interest! Certainly makes a nice pair with the autumn version. That tree is stunning in both autumn and spring, both are lovely shots! @wrongfooted I passed it yesterday too and took some other photos but the sun wasn't out! Wow that splendid sweeping tree is really earning its keep across the seasons. It looks glorious here. Wow, look at the blossom! Lovely blossom. 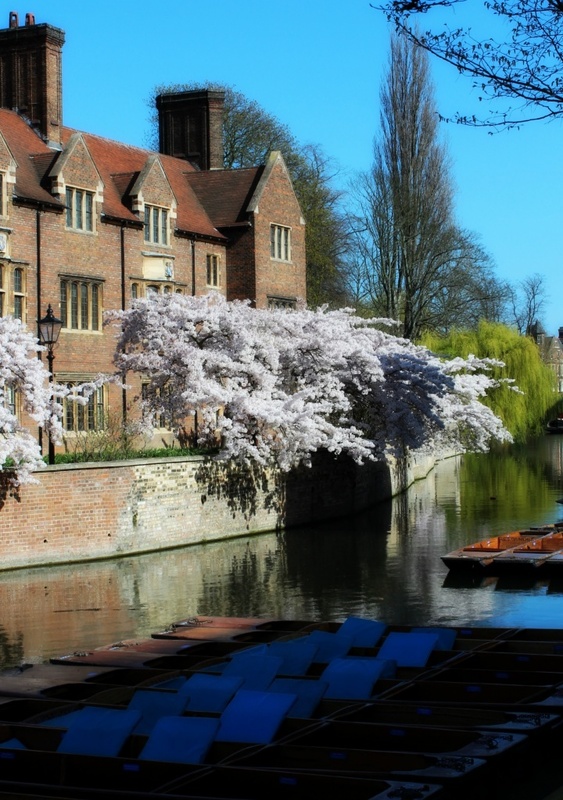 Nice capture of the river and punts with the college in the background. Such a serene shot I love the blues. Oh wow, what a difference the seasons make! great shot! Such a beautiful photo, Judith! I love the blues! Lovely scene and nicely shot. Those trees are really pretty and very unusual - beautiful against the blue sky. Both photos are beautiful. Fantastic colors.